Below are a number of drills you can use in practice with your team to improve their flag football skills. As you get to know your team, choose drills that will address your team's weaknesses (flag pulling, taking the right angle of pursuit, running N/S). Emphasize the fundamentals like the C/QB exchange and proper hand-off technique, flag pulling technique. This is a simple drill that helps develop ball carrying skills and coordination. Divide your team into 2-3 groups. Each group lines up in a straight line. Set up cones every 3 yards (3-4 cones per group should be fine for this age group). Then on the coach’s command, have the first player in each group run around the cones. You can make this drill into a relay race, the first team to finish running through the cones wins the game. With this drill, you can have a number of players work on the proper way to give and receive a hand-off. Divide your players into 2 lines approximately 20 yards away from each other. A player from one line starts with the ball. On the coach’s whistle, the player with the ball races down field (maintaining the proper grip on the football). Once the player reaches the 1st player in the other line, the player with the ball hands the ball off to that 1st player. That player is now the ball carrier and races down field towards the other line. Emphasize holding the ball properly when running, good hand-off exchange (hand-off acceptance target, and good hand-offs into target). This is a great drill to use if you are employing reverse, double or triple reverse plays that rely on a smooth hand-off to be effective. It's great to get your running backs running close to full speed when they take the hand-ff from the QB, making it much easier for them to begin eluding defenders from the start. In this drill, have a center, a QB and a line of running backs wide left or wide right. On the snap, the running back takes off toward the QB and accepts the hand-off using proper technique and sweeps wide then turns it upfield. 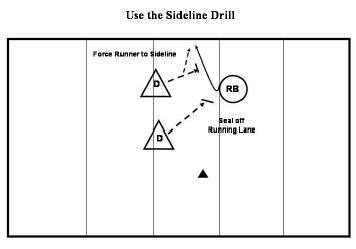 Add cones for the RB to get through and a defender or two to simulate game play. Rotate positions on every play. While one of a Running Back’s goals is not to be tackled, the more important goal is to gain yardage and score. Many young players only concentrate on not getting tackled and run in an East and West direction and then finally running out of bounds for no gain. This happens quite often when a sweep play is called. To avoid having the RB bow out a sweep too wide, practice this drill. Set up a pair of cones just outside of where the Tight End would line-up. This is the area that the runner should run through. At the snap of the ball, the QB will hand-off to the RB who will then cut up field and through the cones. Add another set of cones a few yards apart about 5 yards down field and put a defender there – the RB needs to get through the cones without having his/her flag pulled by the defender. Rotate positions. Players will pair off and begin 5 yards from each other. Have players throw the ball back and forth. Make sure players use the appropriate touch on the pass, according to the distance they are from one until another. After a few throws, have each player take a step back. Continue. Next, make it a competition: pair that drops pass, sits down - go until 1 remaining pair. This is a really effective drill that gets 5 plays at a time involved and in a game situation - simulating a running play. For this drill, on offense you will have a center, a QB and a RB and on defense (1 Lineman and 1 Linebacker). Set up 2 pairs of cones a few yards apart, about 5 yards down field from the line of scrimmage, one pair left of center and one pair right of center - these are the areas that the Running Back needs to run through. This is a great way to practice the Center/QB exchange, the QB/RB exchange (mix it up, left and right) and pursuing the ball carrier and flag pulling. You can have 2 of these drills going on at the same time so that everyone on the team is involved. Have your Running Backs line-up in their proper stance and in their proper position in the backfield (approximately 3-5 yards back). The QB should call out the signals, move and pivot in the correct direction and hand the ball off to the RB. 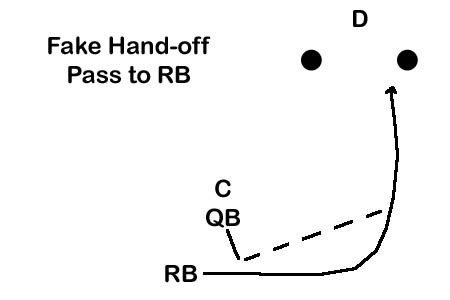 The RB should have a proper hand position so as to correctly accept the hand-off. The QB should make sure that he firmly puts the ball into the RB’s target area. Then, it’s up to the RB to try to get through the designated cones before the 2 defenders pull his/her flag. After each play, rotate the positions. The first step towards a successful pass is the proper QB drop-back and set-up. In this drill have your QBs receive the snap from the Center, drop back 3 steps and setup in the proper throwing stance. After the QB sets up correctly and has the proper footwork, add a Receiver and have the QB throw a pass to the Receiver. As skills develop, add a defensive back to cover the receiver and a defensive rusher to rush the QB, simulating game situations. Practice the 3 and 5 Step Drop Back as well as the Roll-Out Right and Roll-Out Left. Have mini-scrimmages matching up equal teams. This gives each player more of an opportunity to practice making plays and being involved. On offense, have a center, a Quarterback and a Running Back or Wide Receiver versus 2-3 defenders (a lineman, a linebacker and a rusher 7 yards back). Follow all the rules of a regulation game, however, stop play frequently to correct any problems/mistakes and repeat the plays until they are performed correctly. On Defense, you may want to have 1 or 2 less players on Defense then on the Offense so as to make it more challenging for your Defense to make the plays and to allow the offense to gain some confidence, especially in the passing game. Have 2 games going on at the same time to get everyone involved. The Running Back can also be used as a Receiver. The short pass to the Running Back coming out of the back field can be a very effective play. For this you will have 1 or 2 QBs throwing to 1 or 2 groups of RBs. The QB will go through the signals and fake a hand-off to the Running Back. 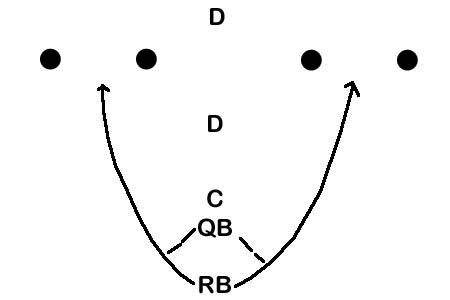 After the fake, the QB will set up for a pass down field, the RB will then run a “flare” pattern into the “flat” (around the line of scrimmage by the sideline). The QB will then throw a pass to the RB. Emphasize the importance of the fake hand-off, the QB’s look down field and then the pass to the RB. A pair of cones 5 yards down field that the receiver has to run through and a defender or two to pull their flags, creating a game like situation. This is a simple drill that works on a number of areas: Receivers must learn how to get open and create space from a defender. QBs focus on set up and throwing, leading the receiver into the designated areas and defenders will learn how to best stay with a receiver. Set up 2 boxes of cones about 5 yards down field and 5 yards square - these are the areas the receiver must catch the pass in. The QB must throw the pass before the receiver enters the designated area. Start without a defender to get the offense comfortable with the drill, then add a defender to cover the receiver. More advanced: add a 2nd WR and defensive back, a center and a defensive rusher 7 yards back to simulate game situations. Like Ultimate Frisbee, but with a football. 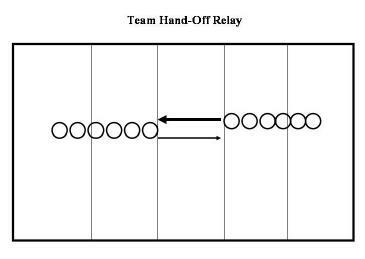 The concept is for the team with the football to pass the ball to teammates without dropping the ball, all the while moving the ball toward the end zone. Set up a large field with an end zone at each end - play can be 3 on 3, 4 on 4 or 5 on 5. The player with the football has 10 seconds to pass the ball to a teammate. The ball can be passed forward, sideways, or backwards. The player with the ball can only take 2 steps after catching the ball. The offensive players without the ball can move anywhere on the field. After a touchdown, the team that was on defense switches to offense and takes possession of the ball on their own 5 yard line. If the ball is dropped or intercepted, play continues with the other team in possession of the ball from the point of the turnover. Each defensive player must stay at arms length from the player with the ball. When guarding the player in possession of the ball, the defensive play is similar to that of basketball. This is a great drill for working on WRs getting open, throwing (leading the receiver) and catching and teamwork. For this game, designate an area on the field for play. All players must stay within this designated area. Start with one or two players designated as the “Shark(s)”. The rest of the players are the “Minnows”. The object of the “Shark” is to grab the flag of the “Minnows”. Once a “Minnow” has their flag grabbed, they then become “Sharks”, and attempt to grab the flag from the other “Minnows”. At the start of the game the “Minnows” should be on the run trying to avoid the “Sharks”. The game ends when there is only 1 “Minnow” remaining. Variation: same concept but have offense run from one end zone to the other. Once they make it safely, allow them to catch their breath, then have them go back the other way. When an offensive player has their flag pulled, they go on defense for the next run. For young players it’s a good idea to use language that they can relate to. Explain to your team that a good defense is like a swarm of Bees around a Hive. Instead of Bees around a Hive, you want your Defense swarming around the Ball Carrier. This drill can be down with the entire defense vs. the entire offense or you can use a skeleton offense vs. your entire defense. At the coach’s command the offense starts the play. When a defender grabs the ball carriers flag instruct all your players to FREEZE! Go around and count how many players are around the ball carrier. You want to avoid 1 on 1 play (only 1 player making the tackle is around the ball). There should be a number of players surrounding the ball carrier. The sideline can be looked upon as an extra defender. If you get the ball carrier close to the sideline, you limit the number of directions the ball carrier can run. 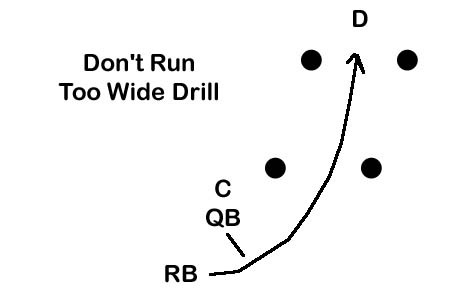 For this drill, shorten the width of the field. At one side place a cone and the sideline should be used as the other boundary. This is the area that the runner is restricted to. This drill is performed with 1 ball carrier and 2 or more Defenders. On the coach’s command, the ball carrier should start down field. It is the defenders’ job to cut off the ball carrier’s running lanes, forcing the runner towards the sideline. The Defense is essentially cornering the ball carrier. It’s very important to teach your defense the proper angle of pursuit. Many young defenders will simply chase a ball carrier from behind, leaving you with 5 players lined up behind the ball carrier all the way down the field. 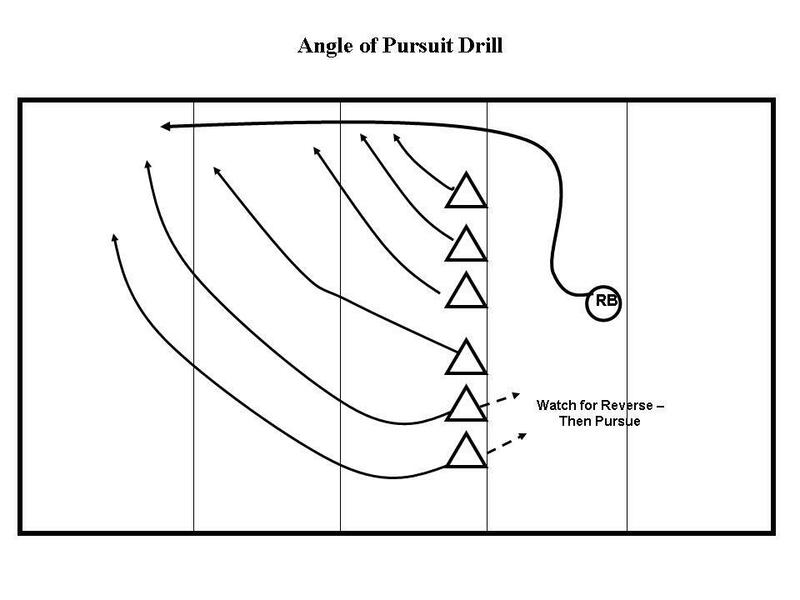 For this drill, explain the importance of the angle of pursuit. First walk your players through their pursuit. Players furthest from the play/ ball carrier will take the largest angle to the play. Emphasize that the players should be running to where the ball carrier will be (not where the ball carrier is now!). After walking your players through their angles, set up the drill at full speed. This drill can be done with the Defensive Line or the entire defense. At the coach’s command or snap of the ball the defenders should begin pursuit of the ball carrier. For this drill the defenders should simply touch the ball carrier. The ball carrier continues down the sideline until all players have touched him. Ideally the defense should touch the ball carrier every 3-5 yards.